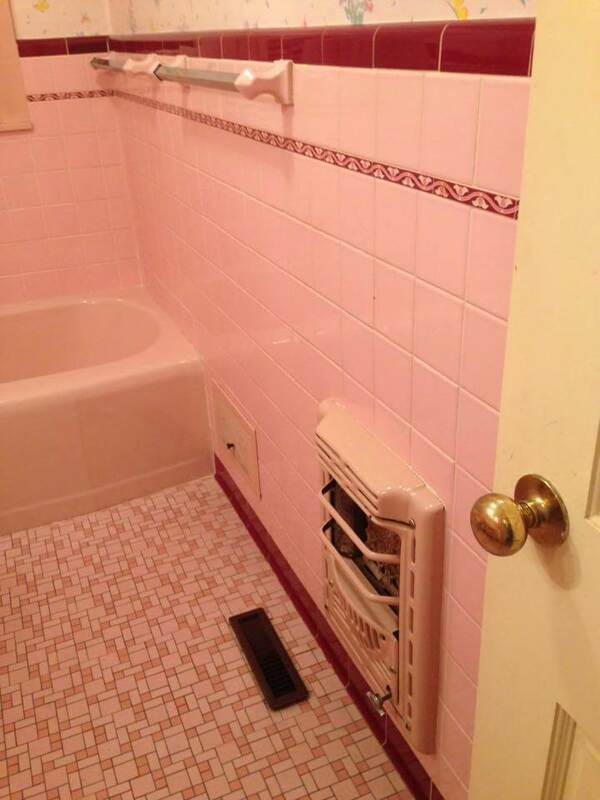 A few years ago I saw my first bathtub and shower surround tiled in with a “crazy quilt” of all different tiles, and it was love at first site. If you love color and pattern, heck, going crazy quilt means can have it all. 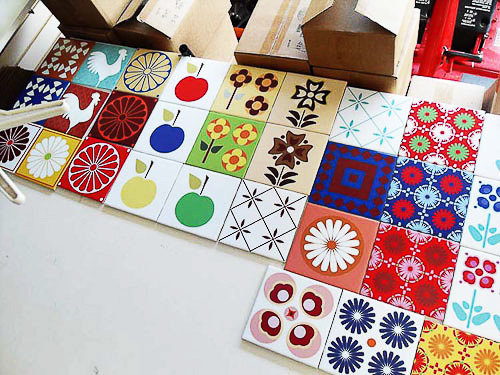 Designer Amy Mescia — with her new company Oscar & Izzy — now has channeled this very idea, creating a everylasting gobstopper portfolio of kitschy, happy, colorful kitchen and bathroom tiles all with a mid mod retro flair. Also brilliant: These tiles are printed onto Dal-Tile 4″ or 6″ blanks… the field colors harmonize with the solid colors in the Daltile line — so you can mix and match. 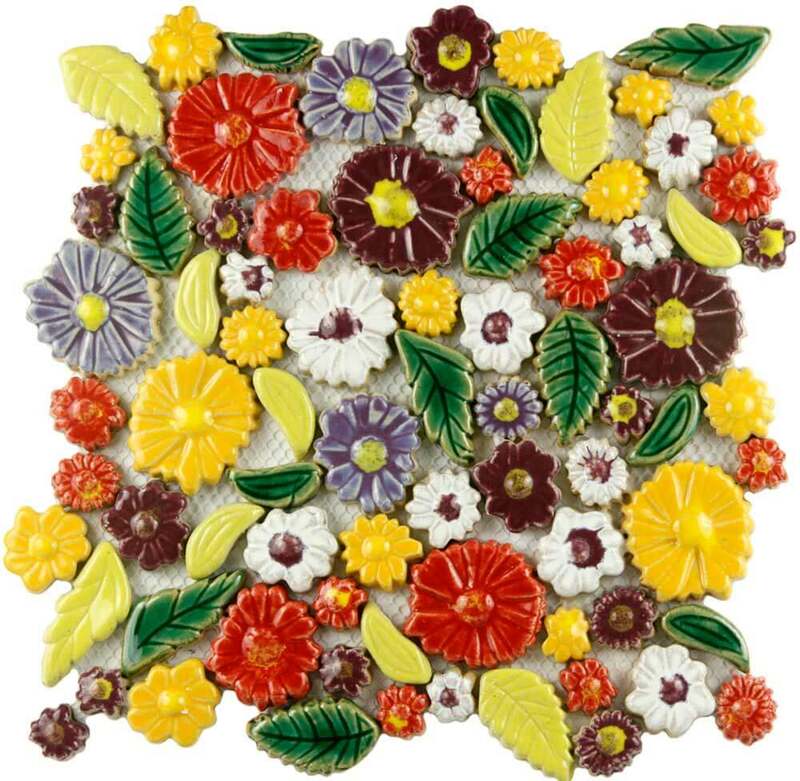 There are no other decorative tiles on the market like this today, we think. I LOVE THEM. I’ve been doing the back-and-forth with Amy, including a phone call, and I also LOVE the story of her tiles: She is a graphic artist by trade, and one day, she saw an email from her alma mater, Kutztown Universityasking for a designer to create some custom tiles for an episode of ABC’s Extreme Home Makeover. A thread running through the design was “patchworks”, and Amy volunteered to join the Extreme Home effort. Her role was to create, in three days (! ), the patchwork kitchen backsplash — shown completed, just above. From this volunteer work, her new venture at tile entrepreneur was born. I have always been drawn to bright, bold colors and was never afraid to incorporate them into my designs, whether during my advertising career or for my own branding business, Oscar Design Studio. 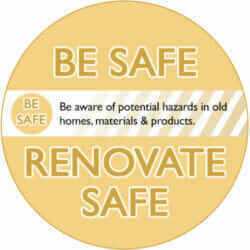 But my love of color took a new turn in 2010, when I contributed design work to ABC’s Extreme Home Makeover. 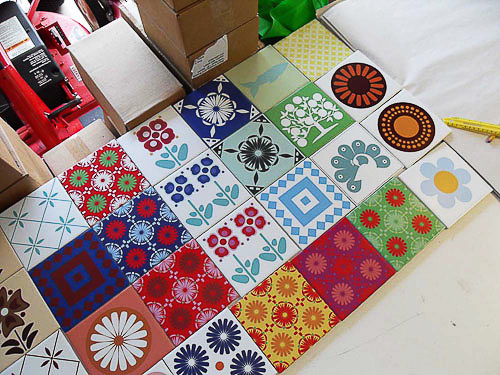 There, my task was to design kitchen tiles that could brighten up the home of a young mother-to-be, who tragically lost her husband. 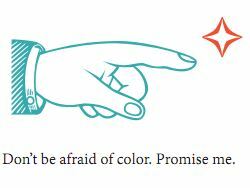 I incorporated retro, bright and bold emotion-changing [pam’s emphasis] colors. After such a moving experience, I launched the tile line as an extension of my design studio. The name I chose: Oscar & Izzy, the names of my artistic grandparents. My tile lines are influenced by a combination of Scandinavian and 1950’s retro art. The “Folksy Love” line draws inspiration from the country roads and farmlands of Lancaster County, Pennsylvania, where I grew up. The “Kitschy Kitchen” line stems from my fond memories of visiting my grandparents and exploring their endless collection of retro knick-knacks. Finally, as I absorbed the effects of the Japan tsunami and earthquake, I focused on the power of nature while creating Earth Quads. Each line has a distinct flavor, but all the tiles have one thing in common: color, and lots of it. 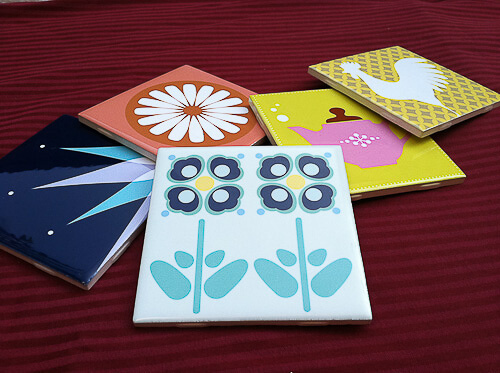 Amy sent me one of the tiles — the two-flowered tile, just above — and I can attest, these look to be very nice quality. Amy works with The Tile Mural Store, which digitally prints her images onto Daltile “blanks”, then has them glazed. 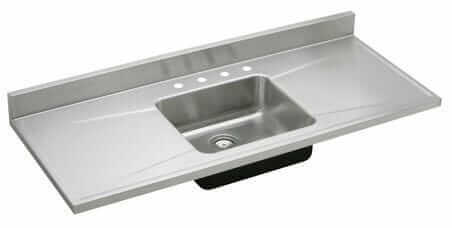 These are great for backsplashes in kitchens and as trim tiles in bathrooms — but they are likely not suitable for heavy wear like an entire tub/shower surround that would likely require continuous, potentially abrasive cleaning. Amy also has some narrow trim tiles to go with — so I could see using some of the squares in concert with some of the narrower rectangles… and as I mentioned, you could match up these tiles to standard colors in the Daltile range to make your money go further. So how much? The dealers set the prices, and Amy checked with one retailer in metro Philadelphia, where she lives. The 6″ tiles sell for about $18, the 4″ tiles, for about $14. So: Not inexpensive, but my goodness, what an impact for the right space. That Extreme Home backsplash — 6″ tiles, 42 designs, each repeated 6 times, for a total of 366 tiles. I’m tallying that up to $6,588, and thinking about the lotto. And yes, Amy says, there have been a few of these complete backsplashes sold. 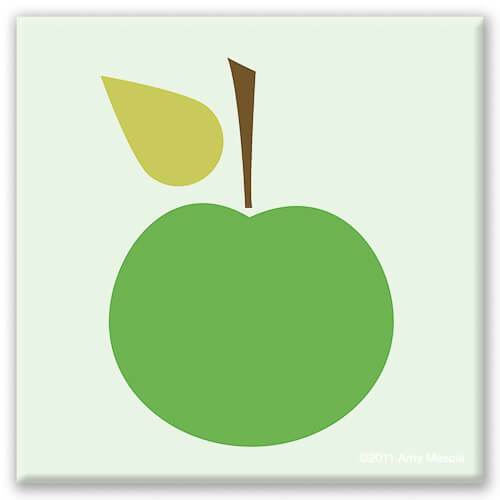 Amy does not sell the tiles direct — you must go through a dealer, and her network is still in early stages. 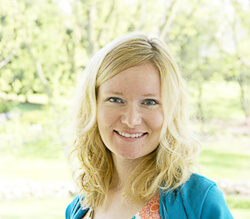 Contact Amy directly to get the lastest list of dealers. See the Oscar & Izzy catalog — delicious! 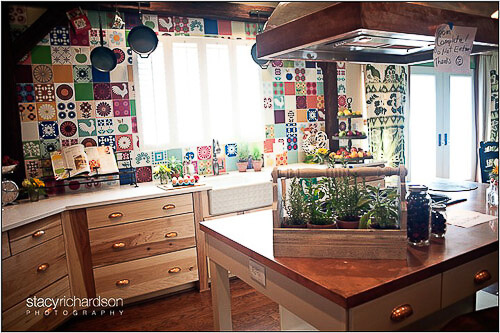 Finally, check out the video from the Extreme Home Makeover featuring Amy’s tile. Note how her patchwork in the kitchen backsplash is carried through in the carpet tiles in the playroom and the afghan on one of the beds — that is a perfect, brilliant, edited touch. And this is a dreamy house — Nicely Done, Ty & team! Amy: I wish you the VERY BEST OF LUCK with your new venture. Go for it, girl! Oh, my! 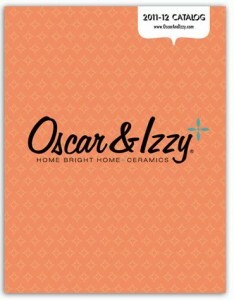 Check out the Lookbook on the Oscar and Izzy website–lots more designs, including some very cute “mod” themes. My fave is Whistler. These tiles are just wonderful. The tiles are now available for purchase directly from the Oscar and Izzy website. The prices have gone up, but I think they’re still worth it. Love the Earth quads. I would have watched the video from extreme makeovers but It’s Private. So I couldn’t watch it. Most of these designs are beautiful, but I would never use all of them together. Too-much visual clutter for me. I wish I’d know about these when I remodeled my kitchen.